Beautiful specimen certificate from The Detroit Edison Company printed in 1977. This historic document was printed by the American Banknote Company and has an ornate border around it with a vignette of Greek gods and a power generator. This item has the printed signatures of the Company's Chairman of the Board, President, and Secretary. In the 1800s, candles or small lamps that burned lard or whale oil lighted the homes and public streets of Detroit. By the middle of the century, whale oil and candles gave way to kerosene lamps, and shortly after, a thriving gas lighting business developed in the city. In 1879, Thomas Alva Edison invented the incandescent lamp, and in 1883, the incandescent light bulb made its first Detroit appearance at Metcalf Brothers dry goods store. Soon other merchants in the city's central business district started demanding light bulbs of their own. And, although no one knew it at the time, the roots of Detroit Edison began to form. By the turn of the century, the Edison Illuminating Co. and the Peninsular Electric Light Co. (which owned the electric distribution franchise in the area) provided all commercial electric lighting and power in the city of Detroit. 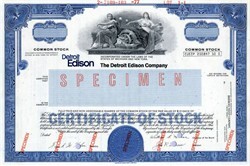 In January 1903, Detroit Edison purchased securities of the two companies and incorporated on Jan. 17, 1903. That same year, construction began on the Delray 1 power plant, and Henry Ford, who had left Edison Illuminating four years earlier, founded Ford Motor Co.
Over the next two decades, the automotive boom fueled the economic and social growth of Southeastern Michigan. In 1904, Detroit Edison signed its first power contract with an automobile company - the Cadillac Motor Car Co. That year, 9,125 cars and trucks were produced in Michigan. There was debate within Detroit Edison about whether the automobile was a fad, and if gearing up for the auto industry would strand the company with excess capacity. But the company correctly anticipated greater use of motors and electric power in factories, and the Delray 2 power plant was added in 1908. In 1915, in spite of the intrusion of World War I, the Conners Creek power plant was completed. That same year, 442,982 cars and trucks - 78 percent of America's total vehicle production - were made in Southeastern Michigan. By 1920, Detroit was booming and its growing population stretched up and down the Detroit River. Between 1924 and 1929, Detroit Edison increased its production capacity by building the Marysville, Trenton Channel and Delray 3 power plants. It also added the Beacon and Boulevard heating plants to support the skyscraper boom in downtown Detroit. Detroit Edison�s engineering research department invented electric devices and worked hand-in-hand with the sales department to create demand for them. The company developed and marketed the electric oven to customers, and electric service spread to rural areas. Detroit Edison was also one of the first companies to promote the use of electric billboards for outdoor advertising. During World War II, automakers converted their plants to support the military efforts. As the "Arsenal of Democracy," Detroit and other Michigan cities produced 92 percent of the vehicles, 87 percent of the aircraft bombs, 75 percent of the aircraft engines, and 56 percent of the tanks used by American military forces. The strain on utilities to keep up with the war effort was felt nationwide. After the war, the housing-construction boom and desire for new consumer goods brought a new wave of optimism. Demand for electricity doubled in the 1950s. Detroit Edison added the St. Clair power plant in 1954 � one of the largest power plant in the world at the time. In 1956, Detroit Edison broke ground for the Enrico Fermi atomic power plant � the world's first experimental liquid-metal-cooled fast-breeder reactor. That same year, the River Rouge power plant was also started. River Rouge Units 1 and 2 � at 260 megawatts each � were the world's largest when they were commissioned. But would "largest" be enough? A 1970 study commissioned by Detroit Edison Chairman Walker Cisler suggested that Detroit would continue to be at the center of tremendous growth in the U.S. The 400-page study called for orderly future development in alleviating the Detroit area's existing and growing environmental and social challenges, and Cisler made the study available "for the use by all concerned with making a better tomorrow." And so began another construction phase that included the start of the Fermi 2 nuclear plant in 1970, and Monroe power plant Units 1 - 4, which came on line from 1971 - 74. Construction also began in 1972 on the Greenwood Energy Center - the company's first inland plant designed for both oil and nuclear-fueled generating units. The Ludington Pumped Storage Plant, co-owned by Detroit Edison and Consumers Power, also went into service in 1973. The 1980s returned the company to more aggressive selling of electricity and the search for new ways to use it. Economic development efforts were designed and launched to help the company - and Michigan - keep and grow businesses. Employees test-drove and learned to maintain electric vehicles. Energy audits appeared for the first time to help customers get more value from the electricity they used. And in 1983, the company sought to sell its engineering expertise through the creation of Utility Technical Services, later called SYNDECO � Detroit Edison�s first subsidiary business. Supporting the new marketing push and increasing customer demand were Belle River Units 1 and 2, which went online in 1984 and 1985. Fermi 2 was licensed that same year and went online in 1988. In 1986, the Detroit Edison Foundation was formed to manage the company's charitable giving programs and volunteer efforts that had grown over the years. Detroit Edison's history of philanthropy dates back to 1918, when the company gave its first charitable contribution to aid the American Red Cross's humanitarian efforts during WWI. Today, this charitable arm of the company operates as the DTE Energy Foundation. In 1991, Detroit Edison earned its first of several environmental awards when the National Environmental Awards Council praised the company for its power plant emissions reduction program. The company continues to actively support programs to improve the environment on the local, national and international level. In the 1990s Detroit Edison began readying itself for the new millennium. In January 1996, Detroit Edison established a holding company - DTE Energy. "DTE" was selected because it was the existing stock symbol for Detroit Edison. "Energy" was chosen to represent the company's vision to provide integrated energy (not just electric) solutions to customers. As DTE Energy looks to the future, the company continues to explore alternative ways to generate electricity and better ways to deliver it safely and reliably to homes and businesses. The company is working hard to create a diverse energy infrastructure - including clean renewable energy - that will meet Michigan�s demand for power without compromising the needs of future generations.